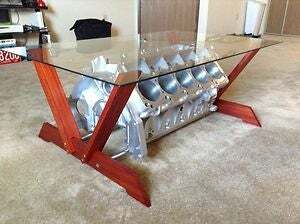 How much would you expect someone to pay for a Engine coffee table? I was thinking of making a 4.0L Jeep I6 table, but it is HEAVY. so onto CL & I found a aluminum block 1MZ-FE ,Lexus RS 300, needs rebuilt motor for $100, which should be lighter, although not as cool or relative to me as I don't own a toyota or Lexus. The Jeep motor I came out even with it and sold the head & intakes and may be able to sell the oil pan and come ahead $20. And if I can do the same with the 1MZ motor it makes up for a good hobby that I May be able to make some money to tinker with. The photo above is a viper motor that is on eBay right now for $3,000. If I can build the table like that and sell it for say, $300-500 I would be able to look for a V8 and continue playing with the idea. What Say you Oppo? How much would you be willing to pay for a V6 engine table?